St Mary’s Church of England Primary School, like all schools in Islington, is committed to meeting the needs of all pupils including those with special educational needs and disabilities (SEND). ongoing feedback from our school community at St Mary’s School. or contact our school Inclusion Leader, Mrs Mayende on 020 7359 1870. Below are some examples of SEN planning documents which are used at St Mary’s. Find out more about the range of inclusive quality first teaching for all children at St Mary’s. There are additional interventions which enable children to work at expected levels and highly personalised interventions. What kinds of Special Educational Needs (SEN) does St Mary’s school cater for? Medical needs Where pupils have medical needs and special educational needs, we will plan and deliver education provision in a co-ordinated way with their healthcare plan if they have one. We will also follow the statutory guidance on supporting pupils at school with medical conditions. All of our teachers teach children with SEN. All of our staff recognise the importance of identifying SEN early and making effective provision quickly. The identification and assessment of SEN is built into the schools approach to monitoring the progress of all pupils. We assess each pupil’s skills and levels of attainment when they first come to the school. This builds on the information from the child’s previous early years or school where appropriate, and provides us with information we need to monitor their progress. It also ensures that we discover any areas of difficulty early on. Where children already have their SEN diagnosed or identified we will work closely with the family and our partners to make sure we know as much as possible about the child before they start at the school. Teachers are supported by the Senior Leadership Team to regularly assess pupils’ progress. Where assessments show that a child is not making adequate progress, our first response is to make sure there is high quality teaching in place. Making high quality teaching normally available to the whole class is likely to mean that fewer pupils will require additional support. If their progress continues to be slower than expected the teacher will work with the family and the Inclusion Leader to carry out a clear analysis of the child’s needs and identify if they need additional support. Most of our pupils with SEN have their needs met as part of high quality teaching. This may include teachers adapting what they do and having different approaches to meet different learning styles, personalised learning arrangements for different pupils and a range of interventions normally provided by the school. 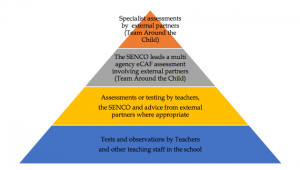 If a pupil is identified (through the assessment process above) as having special educational needs their teacher and Inclusion Leader will consider everything we know about the pupil to determine the support that they need and whether it can be provided by adapting the school’s core offer or whether something different or additional is required. Where provision for SEN is needed, we work with pupils and their families to plan what to do. This usually includes writing a plan of action using one of the SEN planning tools we have available to use. The tools we use are summarised below. Provision Mapping: A document that is used to capture targeted and specialist interventions that will be ‘additional to’ and ‘different from’ the usual differentiated curriculum. Individual Plan (e.g. Pupil Passport): Our new format for Individual Plans contains a one page profile and an action plan listing the goals and provision to meet the needs. SEND Support Plan: A document containing a one page profile and a detailed action plan listing the goals and provision to meet the needs. This is the same action plan that can be used as part of the eCAF and the EHCP. 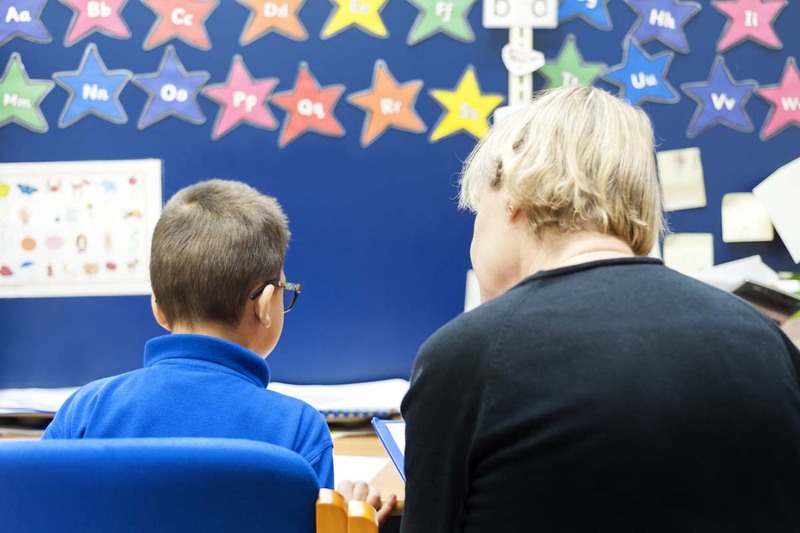 Statements of Special Educational Needs: Statements are issued by the Local Authority and set out the special educational needs of a pupil, the provision the school must make for the pupil and any additional resources being given to the school by the Local Authority to meet those needs. From September 2014 statements are being Provision Mapping Individual Plans (e.g.Pupil Passport) SEND Support Plan EHCP and EHCP Support Plan SEN Support phased out and are being replaced by Education Health and Care Plans for those that need them. Some statements may be converted to SEND support plans. Education Health and Care Plan (EHCP): Where the school has done everything it can to identify, assess and meet the SEN of the child and they are still not making the expected progress, the school or parents may consider requesting an Education, Health and Care assessment. The process for requesting an EHCP in Islington can be found on the Council’s Local Offer website. The EHCP includes a detailed annual support plan/action plan. This plan sets out the goals for the pupil for the next year, and the activities that everyone supporting the child will put in place to support them. The quality of teaching is the most important factor in ensuring all pupils make progress. We regularly review the quality of teaching in the school and ensure that teachers are able to identify how individual children learn best and what support they need. We test the effectiveness of our SEN provision by checking pupil progress and to see if the agreed goals and outcomes for a pupil are being met. Where professionals from health or social services are involved with the child we will ask for their help to inform and review progress, to make sure that all those supporting the family are working together effectively. The teachers work with the Inclusion Leader, the parents and the child to make sure any SEN support is adapted or replaced by another approach if it is not being effective. The Inclusion Leader and the head teacher report regularly to Governors on the quality of SEN provision and the progress towards outcomes being made by pupils with SEN. Governors also consider the attainment data for pupils with SEN and compare it with the progress of other pupils and the progress of pupils in similar schools. This helps to ensure that the approaches used to meeting SEN are based on the best possible evidence and are having the required impact on progress. Every pupil in the school has their progress reviewed regularly and this information will be shared with both parents and pupils. We provide an annual report to parents on their child’s progress, at the end of the school year. Where a pupil is receiving SEN support, we provide feedback to parents regularly. We also have a review meeting at three times each year. Some pupils with SEN may have more frequent reviews if they are required. Reviews may be led by the child’s teacher with a good knowledge and understanding of the pupil’s needs and attainment, supported where necessary by the Inclusion Leader. A record of the outcomes, action and support agreed through the discussion is then shared with all the appropriate school staff and the pupil’s parents. When the school has an Ofsted inspection the Inspectors take a particular interest in the progress of pupils with SEN. The school’s most recent OFSTED inspection can be found on the school website. All pupils, including those with SEN, have access to a broad and balanced curriculum. Teachers plan lessons carefully and think about the wide range of different needs in their class and use the information from assessments and progress reviews to set targets which are deliberately ambitious to encourage pupils to aim high. Teachers plan their lessons with the SEN of pupils in mind, which means that most pupils with SEN and disabilities will be able to study the full national curriculum along with their peers. Teaching staff always aim to match the work given to pupils with their ability to do it. School staff such as Teaching Assistants, Learning Support Assistants and other specialist staff, may be directed to work with pupils, in pairs or small groups or individually. The type of SEN support provided is based on reliable evidence of what works. We are careful to avoid the over reliance of individual support for pupils as evidence shows that in many cases this prevents them becoming independent learners. The Inclusion Leader, supported by leaders throughout the school ensures that staff have sufficient skills and knowledge to deliver the interventions that pupils need. We are committed to meeting the needs of all pupils including those with SEN. We have a duty not to directly or indirectly discriminate against, harass or victimise disabled children and young people. We make all reasonable adaptations to the curriculum and the learning environment to make sure that pupils with SEN are not at a substantial disadvantage compared with their peers. We work closely with families and partners to work out what disabled children and young people might need before they start with us, and what adjustments we might need to be make. We discuss with families what we could do to adapt the curriculum and/or the building as necessary, and in order to getting additional resources and support. 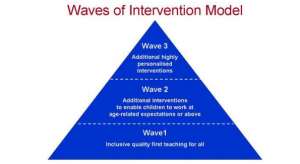 The school organises the additional support for learning into 3 different levels (also called waves). The values and curriculum within the school aim to encourage the emotional and social development for all pupils, including those with SEN.
We work hard to create a culture within the school that values all pupils, allows them to feel a sense of belonging and makes it possible to talk about problems in a non-stigmatising way. We have clear policies on positive behaviour and anti-bullying that set out the responsibilities of everyone in the school. We have clear systems and processes so that staff can identify and respond to mental health difficulties. Family support and/or therapy by health professionals – to help the child and their family better understand and manage behaviour. For further information please see our behaviour management policy on our school website. Who is the Inclusion Leader and how do I contact them? Our Inclusion Leader is a qualified teacher and also the Deputy Head, who is working at the school and has responsibility for SEN. The Inclusion Leader works closely with the head teacher and governing body as well as all teachers. If you have concerns about your child you should speak to your child’s teacher before you speak to the Inclusion Leader. You can request a meeting with the Inclusion Leader in person, by email or phone. The Inclusion Leader is also available at parent’s evenings and in the school playground each morning and at the end of the school day. The school supports its staff to access a wide range of information on appropriate interventions for pupils with different types of need, and to access associated training to ensure they have the necessary knowledge and expertise. The responsibility for ensuring staff have the appropriate training and expertise to meet the needs of pupils with SEN training is shared between the Head teacher, Inclusion Leader and the Governing body. We closely monitor the training and development needs of our staff through annual appraisal. The following tables show the training and expertise of the school staff. What equipment and facilities are available to support pupils with SEN? St Mary’s is a one level site with one playground, separated into a large and small area that are both at the same level and step free. Our school building is a one storey block. All classrooms are arranged on the ground floor. There a disabled toilet for adult use. The school offices, staffroom, ICT/Music room, hall, small teaching rooms and first aid room are all on the ground floor. The school has lift access, ramps and step free access. commenting and contributing to assessment, planning and reviews during discussions with our Inclusion Leader or other professionals. If your child has a SEN statement or an Education, Health and Care plan we will discuss their progress with you every term and have a formal review with you and your child at least annually. Further information about reviews can be found in question 3b above. Meetings with teachers and SEN staff to discuss progress and support including ideas for home. Parents as Educators programmes e.g. maths workshops, Early years workshops on maths, Early writing, Phonics and reading. If we think your child needs significant amounts of extra support we will always discuss this with you and, where appropriate, a meetings with the parents and the people supporting your child can be arranged. We have parents and Parent Governors who are happy to talk with prospective parents to share their experience and answer any questions you may have; if you would like to talk with one of them please contact the Inclusion Leader. Engaging all pupils as active participants in their own education and in making a positive contribution to their school and local community is a priority for the school. Ensuring staff are skilled in working with children, parents and young people to help them make informed decisions and have access to training so they can do this effectively. We ensure that pupils with SEN are included and represented in the groups and activities that we have set up to listen to the views of pupils and involve them in decision-making. This includes our school council and annual pupil survey. The views of the individual child sit at the heart of the SEN assessment and planning process at St Mary’s. We will make sure that assessments include the wishes and feelings of the child, their aspirations, the outcomes they wish to seek and the support they need to achieve them. Whenever possible we include pupils with SEN in planning how best to support them, and in reviewing their progress. This may include the use of questionnaires, story boards or symbols. All pupils with SEN will have specific goals and outcomes and they will be part of the discussion to agree and review these. Where a personal budget is being used for those with an EHCP, the school will support the child’s involvement in decisions about their support. We are committed to providing excellent services to all our children and their parents and we believe the best way to do this is to listen to your views. We encourage parents to contact us about their concerns and not to wait for the next formal opportunity to meet. So if you have something to tell us, whether good or bad, please contact the class teacher or Inclusion Leader. The SEN Governor (a letter can be submitted through school office) who will then refer to the complaints procedure to address the issue. Further information about our complaints procedure can be found on our school website. We realise that parents can sometimes find schools a bit scary and may need someone to help them approach us if things aren’t going well. If you need support to raise a concern or make a complaint this you may want to contact Centre 404’s Parent Carer Support Service, an independent organisation that provides a disagreement resolution service. You can contact them on 020 7316 1930, or by email to Lydia Hodges at LydiaH@centre404.org.uk. If the matter has not been resolved through the channels described above, as a matter of last resort parents can also make a formal complaint to Ofsted: guidance for parents can be found here http://www.ofsted.gov.uk/schools/for-parents-and-carers/howcomplain, or by phone on 0300 123 4666. Further information on local support for families of pupils with SEN can be found in the Local Offer. We always involve parents in any decision to involve specialists. The main agencies used by the school are shown below. The Bridge School Outreach Service ASD support and advice in schools. Samuel Rhodes School Outreach Learning Difficulties support and advice in schools. Educational Psychology Service Advice given in schools. Observations of children one to one and meetings with parents and staff to feedback and provide advice and possible further referrals. CAMHS (Child & Adolescent Mental Health Service) Support and advice given to school. Regular meetings with children/ and or families. AAP (Attendance Advisory Practitioner previously known as Educational Welfare Officers) Supporting families to ensure children have good attendance and punctuality. Behaviour Support Service Supporting staff to include children and promote positive behaviour. PASS (Physical & Sensory Service) to support pupils with hearing/visual Impairment Provide regular advice and support to school. Lead on suggestions for children through providing plans of support for children. Social Services Support families and safeguard children who may be at risk of harm. We run an annual ‘Meet the Agencies’ event each autumn, in which we invite parents/carers to come and meet some of the different outside agencies with whom we work. Gives free, impartial information, advice and guidance about services for children, young people and families. All children with SEND and their families may be particularly anxious about changing classes or ‘moving on’ from school to school. We work with families and our partner organisations to make sure changes are planned and well managed. We will contact the Inclusion Leader at the new school and share information about the special arrangements and support that has been made to help your child achieve their learning goals. Transition meetings are held within school with the new class teacher. Work with child to prepare for the next class through: Transition books, transition programme, visual supports and visits to the next setting. This will be shared with parents and transition books that can be taken home over the holidays. Additional multi-agency meetings will be arranged to create a more detailed transition plan which may include more visits to the new school and/or additional visits from the new school for the children where these changes are more complex. All Local authorities must publish a Local Offer, setting out in one place information about provision they expect to be available across education, health and social care for children and young people in their area who have SEN or are disabled. keeping the Local Offer information up to date and identifying gaps in provision.